With the holidays quickly approaching, everyone is starting to look for the perfect gift for someone sweet in their life! I highly recommend Buzz + Bloom, a globally sourced craft-style honey that captures the natural and diverse goodness of the honeybee. The extensive variety of Buzz + Bloom Honey makes a great stocking stuffer for friends and family. With more than 10 varieties, you’re sure to find the perfect treat even for the pickiest person on your list. Buzz + Bloom Honey is not just for those looking for some flavor in their tea or favorite dish – the Raw & Unfiltered Honey can be used as a hair mask, or a great facial! This organic honey features bold floral notes with hints of vanilla and cherry. It is perfect for baking, with mild cheeses, in salad dressings, herbal teas and seafood marinades. USDA Organic, Non-GMO verified by the Non-GMO Project. Sourced from Brazil. 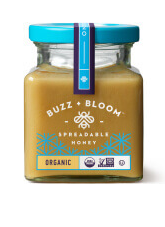 This spreadable honey is certified organic creamy honey spread with soft butterscotch & golden raisin notes. It is delicious on toast, biscuits, bagels & waffles or as a dip with apples & celery. USDA Organic, Non-GMO verified by the Non-GMO Project. These single serve packs feature bold floral notes with hints of vanilla & cherry. It is perfect as an on-the-go natural sweetener for tea/coffee, on pastries or right out of the packet for a sweet treat. 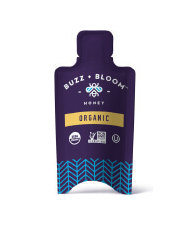 You can purchase Buzz + Bloom honey products online at www.buzzandbloomhoney.com.